... anyone else take advantage of Amazon Prime Day? Is it crazy to anyone else that "Prime Day" is now a thing? Like, I saw other stores with ads that said "Prime Day" - like its a National Holiday now. So strange. But I totally watched the sales all day long & of course, the things I wanted (some essential oils, a $50 Panera card) all got sold out before I could snag up on it. Drats. But I did finally give in to the Alexa trend & ordered an Amazon Dot. I just mainly want it to connect it to good speakers so it can play my Spotify in the house. & of course, to use it in arguments against Ricky on what actor is in what movie. .... blowing out candles on birthday cakes gross me out. I just see the birthday person's breath - or (shutter) spit - flying all over the cake everyone is getting ready to eat. Nope. Anytime I see someone blowing out a candle on a cake, its the best diet in the world for me. I'll pass. ... I feel like I would be amazing on the game show $50,000 Pyramid. ... Anyone watching The Bachelorette? I am so hoping Rachel & Peter are engaged. I think they are just the perfect fit. And if not, I'm keeping fingers crossed he's the next Bachelor. Or at least the next James Bond in that tux! ... I choose places to eat sometimes solely based on the taste of their tea. ... Scary times. We've had a disgruntled coworker that quit his job - HE QUIT - not fired - & apparently, he's made threats to come back to our work & shoot everyone here. What? What kind of world is this? He made the claims to the unemployment office so they called us to let us know. Needless to say, we've been keeping all our doors locked & changed all the codes to the entrances.... but still? How scary is that? I am a nervous wreck going to my car for lunch or leaving for the day. People are just down rights nuts anymore. ... I am now on the hunt for the whole series of Anne of Green Gables ever since I watched the Netflix series, Anne with an E. I loved the old series growing up & loved this new remake of it - but have never read the books. So I'm on the hunt for a nice collection of them. I see Amazon has some cheap paper back ones that the reviews say are horrible with the printing being off line & the ink not great. So I'll just keep looking for a good series somewhere. This one is beautiful... & $165.00 - wow! .... what is the deal with radio stations that play the same songs OVER & OVER again? Do they not realize they drive people to other options like Spotify or Panora or any of the streaming options. Seriously - I kept track of the station I listen to at work - a Christian station - that plays on REPEAT either Casting Crowns or Mercy Me. One normal work day, I heard the songs 23 times. I kept a check list. I even tweeted about it & the radio station said they do indeed play the highest ranked songs of the time. Yeah - I get that - but on repeat a few hundred times a day? Overkill IS a thing. O man that is scary stuff going on at your work. For everyone's sake I hope I don't hear about your work on the news later this week. I was kind of bummed that anything I "needed" wasn't a prime deal on Amazon yesterday. That's pretty scary. Did you all call the police about the threats? Might not be a bad idea. There may not be much they could do, but they could at least talk to the guy. I know we get those kinds of things reported and attempt to check them out. Stay safe my friend. I avoided Prime Day but thought it was funny/ironic that I was getting tons of emails from other stores about all their one-day-only sales yesterday. Workplace violence scares me! I'm not a manager but I am the only one in payroll so if someone's personal financial situation is screwed up and they're already hanging by a thread mentally ... then they see a problem with their pay, would they come after their manager or me? Scary times when workplaces have to do intruder drills just like they do in schools - and yep, we do the drills annually now. THANK YOU for letting me see I'm not the only one totally grossed out when someone blows out birthday candles! As soon as I see candles lit on a cake, I'm done. Even if the cake is from some awesome bakery ... cakes aren't normally served with a side of spit, so no thank you! I never thought of the birthday cake thing until you mentioned it, but now I'm kind of grossed out by it lol. And yes the radio station repeat songs kills me!! I always start out liking a song, and then by the time the radio station plays it 400 times I never want to hear it again. All the things I wanted were sold out to on Amazon but I did get some Bento boxes. So sorry about work, hope you are all safe and he cooks his engines! 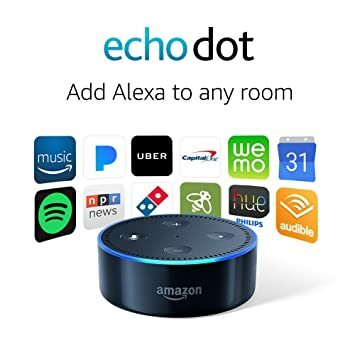 Your reason for wanting an Echo Dot - so that it can be a referee for you and Ricky on movie nights - totally cracked me up!! That sounds exactly like Wayne and I! Girl, I could NEVER say no to Birthday cake!! Wow that's sad that he was so upset about work. But I know that the Lord is with you Becca. <3 Keep on trusting Him. Oh man, nutzo people in the workplace scare me. I've been pushing more and more training against workplace violence, how to spot it ahead of time, but how to defend in case it happens. Run, Hide, Fight - those are your options in order that you should take them. Run if you can, hide if you can't, fight if you must. And think of items on your desk that COULD BE a weapon. So, hurling a stapler or coffee mug at someones head, or hiding behind your desk chair or in the bathroom if the doors open in and you can brace with your feet lying on the floor. Even throwing utensils at someone. I hope it never comes to that, ANYWHERE, but hope people are as prepared as they can be in case it does. You have never read Anne of Green Gables! It's one of my favorites. You so need to read them, you will love them. Oh my goodness, yesss with the radio! It's pretty bad. Is it K-Love? Do you get them by you?!? It's the only thing I listen to in the car with the boys. They have Mercy Me on repeat all.the.time. While I truly love their songs sometimes the passion behind it gets lost for me when I hear it 10 million times. I never thought about the candle thing and now I won't ever forget it. And that's a great diet tip right there! Blow those candles, baby! And no cake for me! LOL! I'm so sorry about the scary work situation. People are so nuts these days. I just don't understand why violence is our first go-to. I get upset. Angry. But grabbing a gun and shooting people isn't even on my radar. I'm glad, though, the unemployment office gave you guys a head's up. I don't watch the Bachelorette so I don't know who that guy is, but he is certainly rocking that tux! James Bond, indeed! And I hate how a radio station can ruin a great song by too much airplay. I used to work in Human Resources and we had a couple of legitimately scary people that were let go. They installed a "panic button" that would summon the police - but I kept thinking, yeah, that's so the police can get here AFTER we've all been shot. Yikes! I hope your guy was just shooting off some steam & has calmed down by now. I really really wish the thought of birthday spit would keep me from eating cake. Nope - an extra large slice please, with extra icing! hahaha, to the candle thing, ewwwww...so gross. I started watching the Anne with an E because of you, and I almost couldn't get through the first episode. I just found her super annoying with how much she talked, oh goodness. But I stuck with it and by the end I wasn't hating her as much. I'll give it a few more episodes. I never saw the original so maybe that's why? People are scary these days! I have sirius and I think a ton are on loops, they play the exact rotation over and over. We have an original Alexa and Scott uses it to play music but I never use it. I was eyeing the echo, but never got it. I did do plenty of other damage. Seriously have a prime day hangover today!!!! I agree with you about the radio stations. The Christian music stations here in Seattle do the same thing, one song over and over. It's on when you're in the bathroom getting ready for work, it's on in the car as you drive to work, it's on at lunch. Why? When there are SO many great songs they can be playing?! Yes, we bought a few things on Prime Day and one of them was an DOT. We have a full-size Echo and have had it for a couple of years. Our new house is long and I wanted one in the kitchen for music or recipe ideas. We love Alexa!! Scary stuff with that employee who made threats. Be careful!! So funny about the blowing out the candles thing...I'd never noticed or thought about it before, but hopefully you haven't ruined birthday cake for me now! Ha ha. And super creepy about that guy from your work...stay safe! Those book spines are gorgeous... And I hate when a radio station runs the same program over and over. (Like a satellite station.) It's the same top 40 countdown every day at 10am for a week. WTF! We have a dot but I rarely use it... I should use it more often! Hope you love yours! I don't know if you've ever seen the show Monk, but there's an episode where he makes a shield to go over a birthday cake so people can't spit on it when blowing out the candles (it ended up catching on fire, lol). So scary to hear about your old co-worker! Praying for your safety & hoping you're able to find some peace in the situation. That is soooo scary about the crazy ex-employee. Praying for your safety. I haven't watched much of the Bachelorette this season. It has been boring. I did watch this weeks though. To the final four! I got an Echo on prime day. I can't wait to use it.